Washington, DC – In early February, Punxsutawney Phil, the nation’s most famous groundhog, saw his shadow and “predicted” six more weeks of winter for the U.S. He couldn’t have been more wrong. 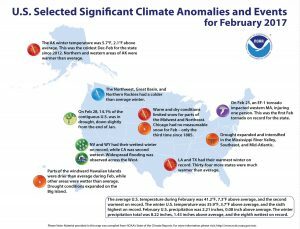 In fact, an unseasonably warm February helped to boost winter temperatures for most areas east of the Rocky Mountains. And while parts of the West saw record precipitation, 10 states in the eastern half of the nation were much drier than average. Last month, the average contiguous U.S. temperature was 41.2 degrees F, 7.3 degrees above the 20th-century average. 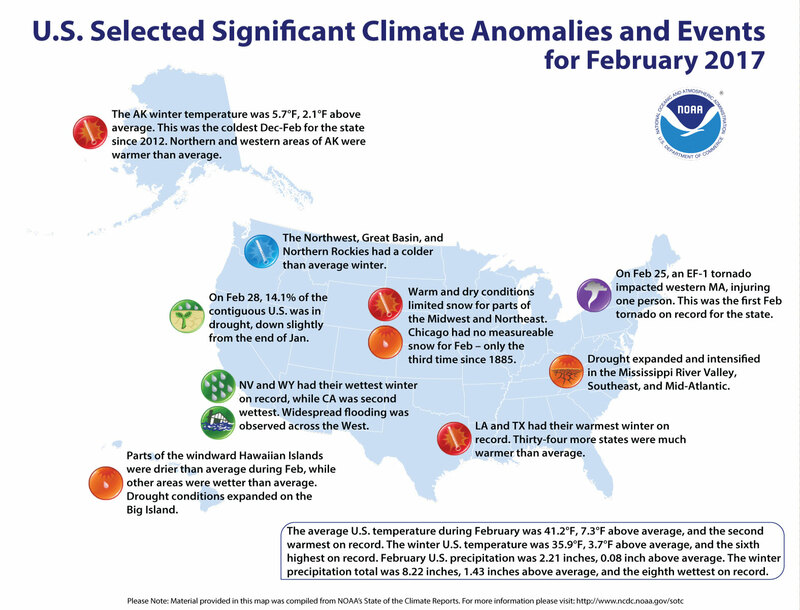 February ranked as the second warmest February in the 123-year period of record, according to scientists from NOAA’s National Centers for Environmental Information. Thirty-nine states from the Rockies to the East Coast were much warmer than average, and of these, 16 across the South, Midwest, Mid-Atlantic and Northeast experienced record warm temperatures. The average precipitation total for February was 2.21 inches, 0.08 inches above the 20th-century average. Above-average precipitation across the West offset below-average precipitation in parts of the Midwest, the Southeast and along the East Coast. For only the third time on record, Chicago had no measurable snow in February. The average winter (December 2016-February 2017) temperature across the contiguous U.S. was 35.9 degrees F, 3.7 degrees above average, making it the sixth warmest winter on record. Thirty-six states were much warmer than average. The average winter precipitation total was 8.22 inches, 1.43 inches above average, ranking this winter as the eighth wettest on record. Nevada and Wyoming had their wettest winter on record, with precipitation totals 194 percent and 179 percent of average, respectively. California had its second wettest winter with precipitation at 184 percent of average. 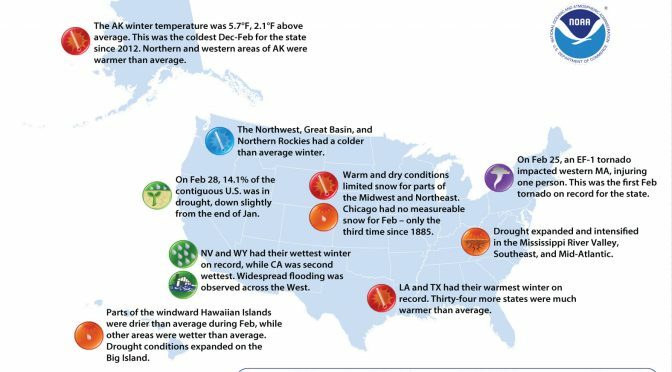 The average winter temperature in Alaska was 5.7 degrees F, 2.1 degrees above average. Northern and western areas of the state were warmer than average. Despite being above-average, this was Alaska’s coolest winter since 2012.